Did you make way too much filling for dumplings and get stuck with too much filling? Oops so did I. I got sick of making dumplings about 2/3 of the way through the filling, and instead of just cooking up some noodles to use the rest of the filling with, I decided to make spring rolls. Super easy, super good. 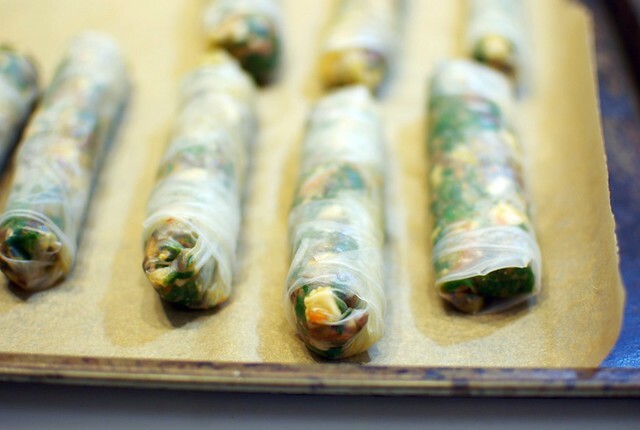 Place 2 tablespoons of filling in the middle of a softened (in warm water) spring roll wrapper. Fold up the side closest to you, then fold over the left and the right. Pulling gently down towards you to make the filling in a tight line, roll towards the remaining side to seal. set aside and repeat with the rest of the filling. Pan fry in a little oil on each side, like you would a sausage. Serve hot, with dipping sauce! I made your Green Bean Casserole and the Tres Leches Cake for my Adopt a Gluten Free Blogger post. Oh yeah, I adopted you! Oh wonderful! I'm making both the dumplings and spring rolls this week. You just made my tummy very happy. 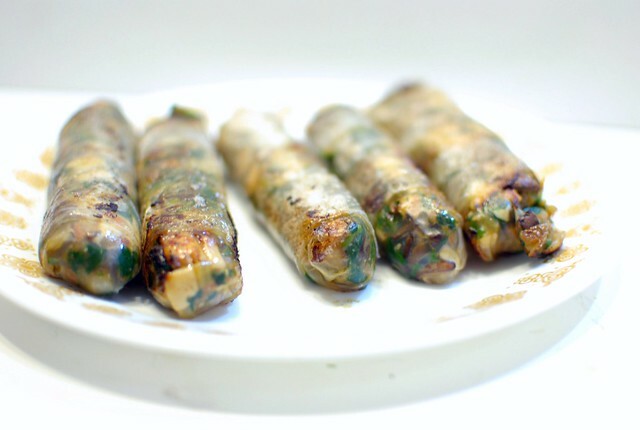 I made a batch of the dumpling filling and turned it into these spring rolls tonight (along with the easy and yummy dipping sauce). My husband and I loved them! My girls said they preferred the traditional cold spring roll with rice noodles, shrimp and raw veggies, but the grown-ups think these fried tofu rolls do winter right. Can't wait to eat leftovers tomorrow. Thanks for the adaptable recipe! you are too funny. These sound great!